Willis » Roger Perron Inc. 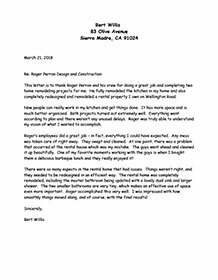 This letter is to thank Roger Perron and his crew for doing a great job and completing two home remodeling projects for me. He fully remodeled the kitchen in my home and also completely redesigned and remodeled a rental property I own on Wellington Road. Now people can really work in my kitchen and get things done. It has more space and is much better organized. Both projects turned out extremely well. Everything went according to plan and there weren’t any unusual delays. Roger was truly able to understand my vision of what I wanted to accomplish. Roger’s employees did a great job – in fact, everything I could have expected. Any mess was taken care of right away. They swept and cleaned. At one point, there was a problem that occurred at the rental house which was my mistake. The guys went ahead and cleaned it up beautifully. One of my favorite moments working with the guys is when I bought them a delicious barbeque lunch and they really enjoyed it! There were so many aspects in the rental home that had issues. Things weren’t right, and they needed to be redesigned in an efficient way. The rental home was completely remodeled, including the master bathroom being updated with a lovely dual sink and larger shower. The two smaller bathrooms are very tiny, which makes an effective use of space even more important. Roger accomplished this very well. I was impressed with how smoothly things moved along, and of course, with the final results!